From sailors long since gone, to the millions of people young and old sporting this maritime symbol, star compass tattoos have been a popular choice of body art for centuries. The star compass is a tattoo design with a secure place in history with some interesting modern twists. Similar to nautical star tattoos, the origins and history of this popular design are somewhat hidden under a veil of sea mist and fog. Evidence of the star compass is found in Irish history, but use of the design as a tattoo has also been discovered on Spanish sailors that predates the late Celtic finds. Regardless of where and when this popular design first appeared on the skin, the meanings behind the star compass as a tattoo remain the same. Sailors worldwide have been adorning themselves with the star cross tattoo to encourage safe journeys on treacherous oceans. It is a popular belief that the design is symbolic of the North Star, also known as Polaris, which appears to us to remain in a steady position above the North Pole year round. Before the age of Global Positioning Systems (GPS) and the aid of a compass, the North Star was the most reliable source of finding one's way by land or by sea after sunset. Many sailors and even some land-bound soldiers also sported the star compass as a symbol of protection and many believed that it would help guide them to their destinations and then back home again. 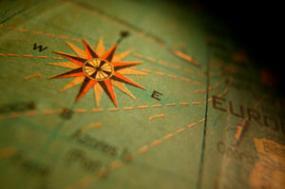 Many maps, especially older maps, incorporate star compass designs as part of the compass rose. The star compass has taken on a whole new meaning within the gay community. Years before homosexuality was more widely accepted, lesbians had the design tattooed in an easily concealable place to hide their sexual orientation during the day. They would then reveal the tattoo at night as an identifying symbol to other gay women. A star compass on your skin does not; however, stand alone in today's society as a homosexual symbol. Still popular with sea-faring and non-sea-faring military personnel, the star compass tattoo continues to be a symbol of protection and guidance. Within the civilian community, the star compass design is also a symbol of following one's dreams and never losing sight of the course that will lead to them. It has also been seen as an anti-racism symbol. In the punk rock crowd in particular, the star compass is among the more popular symbols, usually worn on the wrists or shoulders, but it's not uncommon to see them as neck tattoos, behind ears or anywhere else on the body. For readers thinking of a star compass for a tattoo, there are countless design variations to consider before making your statement permanent. On the Internet, you have access to thousands of photos and templates to evaluate before making your choice. You can even find artists who will custom design a star compass just for you. No matter if you're in the military, what your sexual orientation or your preferred style of music is… there is a star compass tattoo out there for you. Tattoo Johnny has pages of star compass designs available to download either in full color or an easy-to-transfer-to-skin black and white template. For a more "on-skin" interview, so to speak, with your future tattoo, try checking out Every Tattoo, a website where you can look at a few photos of other's star tattoos and see more "real world" examples of star compass designs. Before running out to the nearest tattoo parlor look at designs you like and see which ones you don't like. Think about how a tattoo will look on your skin and consider different colors or just a simple (and usually less expensive) black outline design. Other things to think about include the symbolism of the image(s) you want to incorporate into your tattoo. With so much to consider before permanently modifying your skin, it's important to look and think before you ink to make sure you will be happy with the design of your choice. Whether it's a star compass or skull and crossbones, be positive that what you think you want is what you really want before heading off to the tattoo shop. Tattoo removal is far more expensive than tattoo application.